Vine was the belle of the mobile video ball until Instagram crashed the party last month with its own 15-second reels (with filters!). In an attempt to wrest the crown back, Vine on Wednesday rolled out its “biggest, most exciting update yet” for iOS, with an Android update expected next week. So how does Vine plan to reclaim the throne? One word: Revining. OK, that’s not all version 1.3 has to offer, but now users can “revine” (same concept as retweet) each other’s videos. Vine also added another Twitter feature, protected posts. Like Twitter, Vine has an all-or-nothing approach to privacy. You can make your Vine completely private or totally public, with nothing in between. 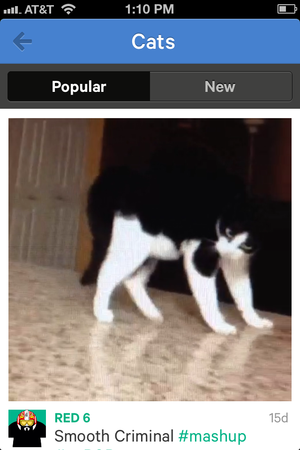 Vine's new cat channel will prevent you from getting anything done ever. Next up is Channels—there are 15 of them to start, in categories like music and comedy. You can submit posts to channels or browse them, and each channel has a feed that helps users discover what’s popular that day. There is a channel for cats and one for dogs. Yes, that happened. Want to discover the next up-and-coming Vine superstar? Now the app lets you find people who are “on the rise” (read: getting lots of likes and revines), by tapping a button in the Explore tab. Vine hinted at the new features when Instagram introduced video, and now those changes here. But more are on the way, Vine cofounder Colin Kroll wrote on Wednesday. What could they possibly be? An additional 11 seconds? Filters? Editing tools? We’ll be waiting with bated breath. This story, "Vine stages comeback (!!!) with cat channels and revines" was originally published by TechHive.